View More In Markers & Highlighters. Experience the thrill of adding vivid Sharpie shades to an incredible aquatic-themed adult coloring book! hand-drawn by expert Sharpie artists, the adult coloring pages need you to add a tsunami of color to bring them to life. Your adult coloring book kit comes with 10 fine-point markers that are both durable and detailed Plus 10 ultra-fine point markers that create razor-sharp marks. Even better, the range of brilliant colors were selected specifically to help you bring the exhilarating marine themes to life. Perfect for adult coloring pages, the Sharpie ink dries fast, resists smearing and won't fade. 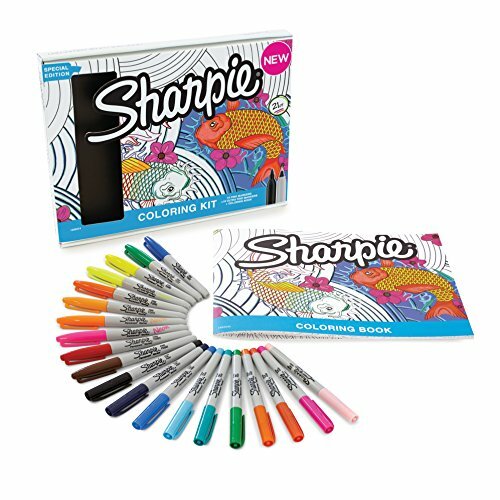 An electrifying way to express yourself, Sharpie coloring markers help you create art that’s too good to keep to yourself. Flaunt your creative side by adding vivid Sharpie shades to adult coloring pages hand-drawn by expert Sharpie artists - and create bold, unique art you'll want to show off and share! If you have any questions about this product by Sharpie, contact us by completing and submitting the form below. If you are looking for a specif part number, please include it with your message.